There were two sections in the design with point-tiré silk thread flowers. The background was done first, with five flowers and buds in pastel shades of pink, blue, yellow and salmon and foliage in a light mint green. The petals were divided into two bands of colours, starting with the outer band. The inner band was worked from the centre, tapering the long and short stitches and pulling the thread from between the stitches of the outer band. Once the stitching was completed, lines of sequins in a river were added, radiating from the centre out to the edges of the petals. It was not an easy task. There were many long days and nights of re-starting, shuffling around the frame to find the right angle, broken threads, angry knots, cramping hands and frustrated breaks. I shared my struggle with my classmates and we all agreed it was a terrible stitch and lamented the amount of it required in the design. At some stage during this process I had my click. I can't remember exactly which flower or leaf it was but I began to flow with five or six perfect stitches. This gradually increased until finally I managed to complete a flower with little or no heartache. I was joyous. The background was made using a variation on the vermicelli technique to create a different effect. Pink and navy blue threads were used with transparent beads and an empty stitch was included after each bead was applied. It was tricky planning how the undulating vermicelli curves would fit between the flowers and the petals. There were a few cul-de-sacs and dead-ends but the technique was relatively easy and the effect was lovely. 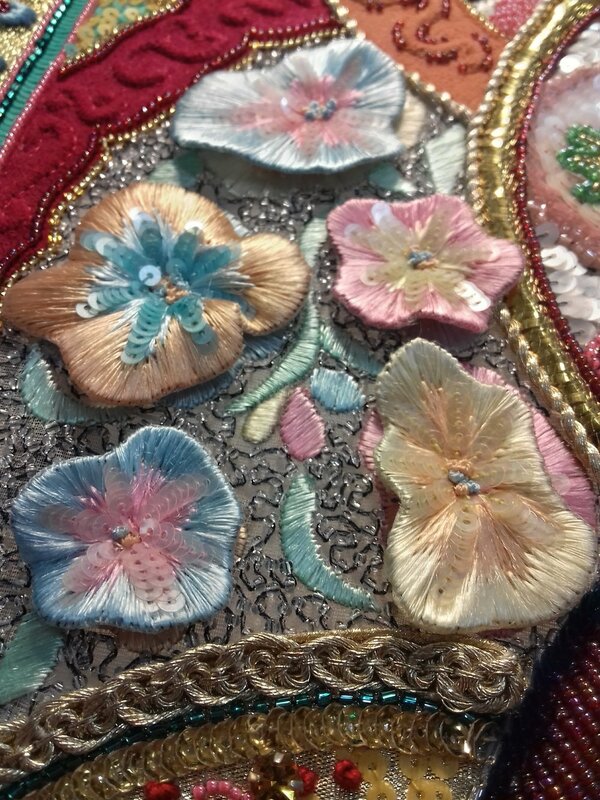 Once the flowers and vermicelli beads were completed in both sections it was time to move on to the flowers on the side of the fabric. There was a lot less tumult experienced when doing these and thankfully no despair. Regardless of the click, the silk thread is inherently difficult to use. Constant massaging of the thread is necessary to keep the filaments woven together and despite these kind caresses it has a capricious tendency to revolt for no apparent reason, keeping you on your toes. I proceeded with caution until finally all the flowers were completed. The next step was to remove the flowers from the side of the pattern fabric. There were steamed first with an iron on a low heat, the vapour reviving the threads to a glistening sheen. Gum arabic was gently applied to the back to stiffen the flowers and stop the threads from fraying. Adhesive paper was ironed to the reverse side and they were cut out of the fabric in a long strip. Each flower was cut out with a 7mm border and the edges were cut with the scissors. The paper was removed and the tabs were ironed back on to the reverse. 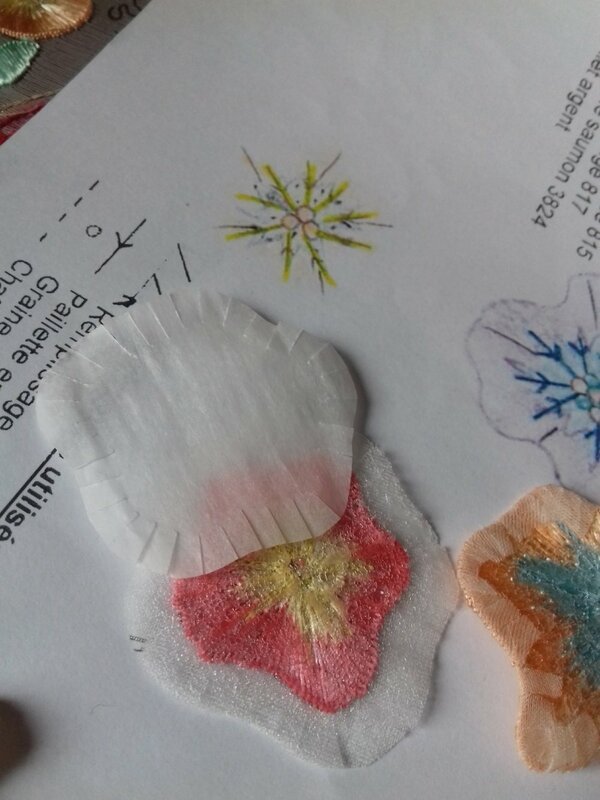 Using the numbered references on the paper pattern each 3D flower was placed over it's corresponding flat flower in the two sections of the final piece. They were held in place using five or six strategically placed stitches that were used to create tension and pull the petals into 3D forms. The final touch was tiny french knots in the centre of each flower. In regards to techniques, I definitely found this one the most difficult and even though I had my miraculous click, I wasn't really sure why. So many people had shared their tips, tricks and theories that I had no idea in the end which worked best. One evening, in desperation and on the advice of an experienced Haute Couture embroiderer, I found myself massaging Clarins hand cream onto the silk thread. Anyway, as with most challenges, it is the section that I am most proud of now. I lovingly gaze at it and am delighted that I managed to master the technique and this joy is magnified with the knowledge that I will never have to do it again!